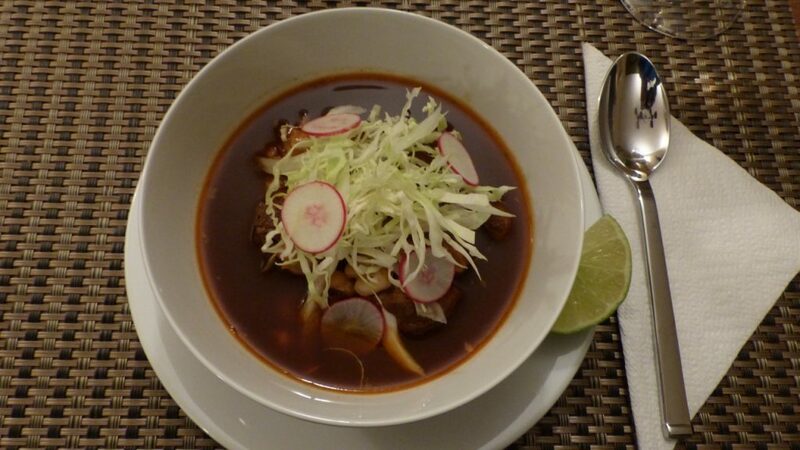 Pozole, the traditional corn soup, or stew, from Mexico, is a great way to ward off the chill of winter. Alma Ayon, proprietress and chef at Sundance Bed and Breakfast in Paso Robles, enjoys a break from gourmet cuisine once in a while. 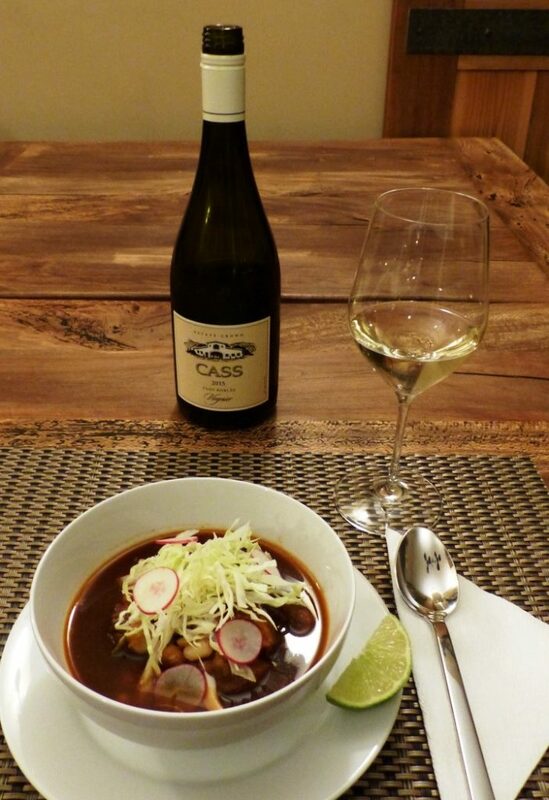 During the cold fall and winter months, she looks to a traditional family favorite, pozole, to take the chill off a day in the vineyard. Who can deny the comforting feeling of putting together a soup or stew and letting all the spicy aromas fill the house? So put the pork up to cook, and use the time to binge watch your favorite TV series, read a book, or…… And don’t forget the wine. Alma suggests pairing this dish with CASS viognier. Place the pork, ½ onion, bay leaf, salt, in a large pot and cover with 14 cups of water. The pork should be completely covered by about 4 inches of water. When the water comes to a boil, skim the surface and cook covered over medium heat for 2 ½ hours. Skim a few times during cooking process. In a separate medium pot, cook chiles, onion and garlic for approximately 20 minutes. In a blender (Vitamix) purée the chiles with the water, onion and garlic. Strain and add to the pork. Add the hominy and cook everything together in low heat for an additional 20 minutes. Pork should be falling apart tender. Adjust salt — most abuelitas, grandmothers, prefer to season soups with Knorr Chicken Bouillon, instead of salt, for a more flavorful broth. Note: Pozole is a soup. Add chicken broth to the pot is the liquid level is low and adjust salt as needed. A favorite dish for Christmas breakfast is Clafoutis, a classic French dessert typically baked with fresh cherries. Clafoutis is easy to prepare, not too sweet, and is just custardy-eggy enough to make a luscious breakfast dish. Our French neighbor has taught us that any fruit in season (except apples which won’t cook through) can be used to top Clafoutis. In summer we use fresh peaches and at Christmas we substitute fresh pears for the cherries. We drizzle the baked Clafoutis with a touch of our late harvest viognier, Jess, and serve with a dollop of cold whipped cream. Because Jess has the classic viognier flavors of peach, apricot and pear, it pairs beautifully with this traditional French dish. 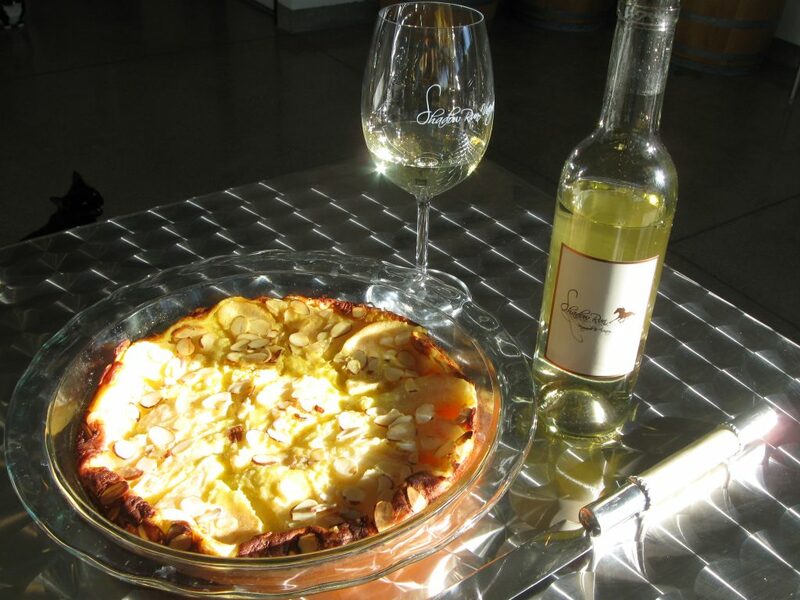 Enjoy Clafoutis warm from the oven with a glass of chilled Jess. Preheat oven to 475 degrees. Whisk together the milk, eggs, sugar, vanilla and melted butter. Mix the flour into the batter last, and whisk until smooth. Pour batter into a 9 inch pie pan. Arrange pear slices on top of the batter. Sprinkle with sliced almonds, if using. Serve with whipped cream and a chilled glass of Jess. Heaven! 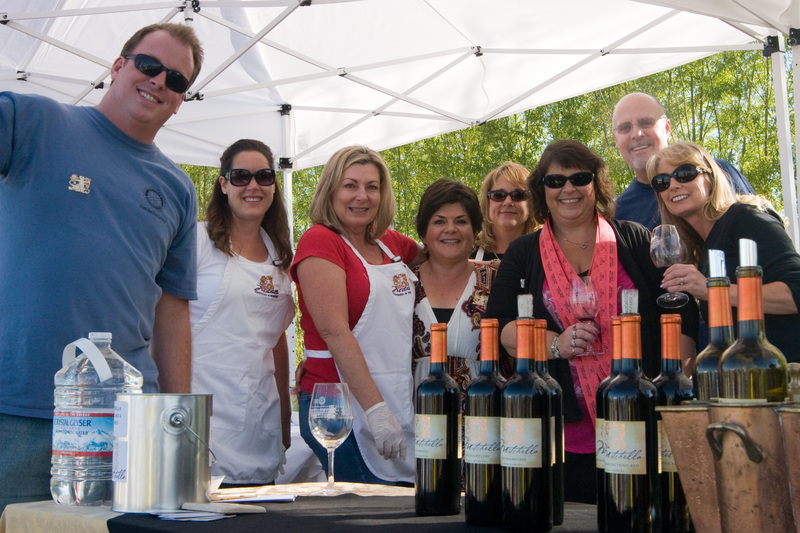 Celebrate International Cabernet Sauvignon Day, August 27th, 2015, with the Back Roads Wineries of Paso Robles. Cabernet Sauvignon is the Paso Robles AVA’s most widely planted wine grape variety, making up almost half of the grapes grown across the 32,000 acres under vine. While cabernet has been king in Paso Robles for decades, it is in the past 10 years that the diversity of cabernet styles from the area have emerged as cutting edge wines from this robust wine producing region. 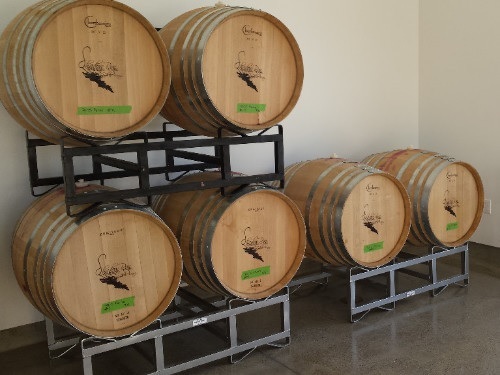 Many of our Back Roads Winery members produce outstanding cabernet sauvignon and cabernet franc and we invite you to visit often and explore the Paso-bilities. Meanwhile to help you celebrate your Cabernet Day, Mitchella Vineyard and Winery has shared 3 cabernet-friendly recipes for you to try. They won the Paso Robles Rotary Winemaker’s Cook-Off “Judges Choice” with the Petite Sirloin Burgers.Whether you try one of these delicious recipes or just throw a thick rib-eye on the barbecue, enjoy the day and the wine with good friends and family. Cheers to #CabernetDay! In a food storage bag, combine the flour, paprika, and salt. Add the beef cubes and toss to coat. Heat 2 tablespoons of the oil in a large heavy pot over medium-high heat. Add the beef and cook, stirring, for about 4 to 5 minutes, until browned. Do not over crowd, cook in batches, remove and set aside. Heat the remaining oil in the pot with the scrapes, add the onions and cook until translucent, about 10-15 minutes, add 2 tablespoons of brown sugar and cook another 2 minutes. Add the beef broth and scrape any remaining bits from the bottom of the pot. Add the beef and collected juices, add the thyme, bay leaves, pepper, and beer. Cover and simmer on low for 2 hours. Remove the bay leaves. Serve over noodles or rice. In a medium bowl combine chicken, golden raisins, seasoning, cheese, jelly and chopped chipotle peppers. Unroll pie dough, using a 3-inch round cutter, dusted with flour and cut out as many rounds as possible, 10-12 for each sheet, should have between 20-24 rounds. Beat the egg lightly in a small bowl, set aside. To assemble empanadas, fill the center of each round with approximately 1/2 tablespoon of the mixture. Brush half of the perimeter of each dough round with the egg wash. Fold over 1 side of the round to make a half circle. Crimp the edges of each empanada with tines of a fork. Place empanadas on prepared baking sheets. Brush each top lightly with egg wash and sprinkle each with a little of the remaining cheese. Bake in preheated oven for 18 to 20 minutes or until golden brown. Coarsely chop six cloves of garlic and sauté in 2 tbsp of olive oil, coarsely chop the mushrooms and add to the garlic, continue sautéing for 10 minutes, add 1/3 cup red wine, simmer until liquid is reduced. Remove, and cool mushrooms in large mixing bowl. Thinly slice onions and sauté in 2 tbsp of olive oil until a light golden brown, about 15 minutes. Carefully, add 2 tbsp of balsamic vinegar stir until reduced, quickly add, still stirring 2 tbsp of brown sugar, simmer until caramelized, about 7 minutes. Remove to small bowl and cover. Add 1 tbsp cumin to one cup of aioli or mayonnaise, mix well, refrigerate. Quarter the slices of cheddar cheese. Slice the tomatoes into 2‐3” rounds. Slice the sourdough baguettes in to ¼ inch slices. Add 1 tbsp cumin to cooled mushrooms, 1 tbsp salt, and fresh ground sirloin. Mix and form into small patties, just less than 1/8 cup per patty. Add butter and 6 cloves of garlic to heat proof pan on BBQ, add sliced sourdough, grill on BBQ until golden brown. Grill hamburgers for 2 minutes, turn add cheese, remove when cheese has melted. Assembly: Sliced sourdough, 1 tsp cumin aioli, burger with cheese, heirloom tomato, caramelized onion, arugula, then top with sliced sourdough. Enjoy! A brief history of the dish…..
Phillip and I have traveled throughout Italy practically every year for the past 17 years (it helps that Phillip has a sister who lives in Tuscany). But a couple of years ago we spent 10 days in the Abruzzo region visiting a fellow winemaker/friend. We tasted a dish that is unique only to Abruzzo and we were blown away. It is so simple, yet so tasty. All it is is skewered mutton. 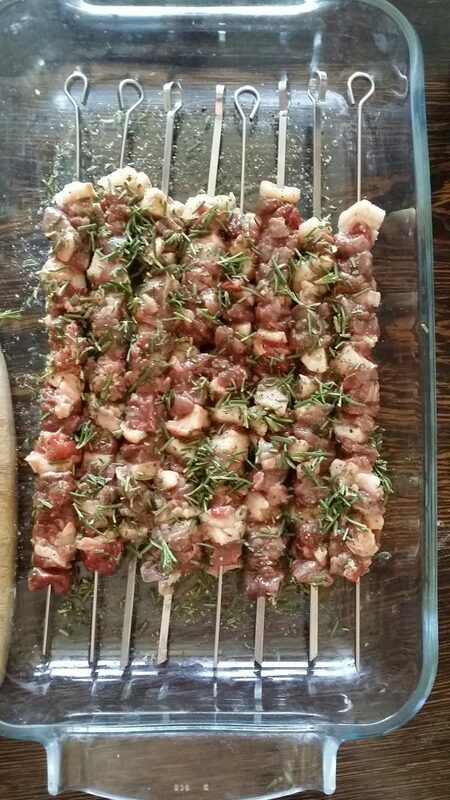 Arrosticini is the food of the mountain shepherds – it is easy and tasty. Typically it is mutton that is cubed in ¼” x ¼”. The cubes are then laced with bits of fat to soften the mutton. The skewers are marinated for a couple of hours and cooked over open fire or a special grill just for the arrosticini. At AmByth, we cook them in our “beehive oven” (a Portuguese clay oven) on a salt block. They can also be bar-b-qued. 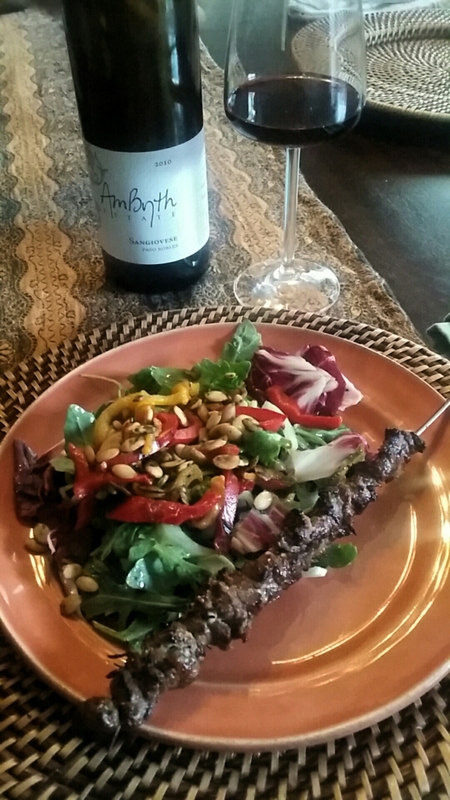 We serve the Arrosticini as a second course with a side salad of arugula and radicchio, tossed with tomatoes, roasted bell peppers, thinly sliced cucumber, pumpkin seeds and sunflower seeds with a shallot/lemon juice/Dijon mustard/evoo vinaigrette dressing. The first course could be fresh pasta with a barely sautéed zucchini sauce. AmByth Estate is Paso Robles’ first and only winery to produce Demeter certified Biodynamic wines. We utilize the Biodynamic method of farming to enhance our observations of nature, and use these intimate insights as tools that allow our 20 acres of vineyards to express their true character through the grapes it produces. Estate Vineyards: Mark’s Vineyard, StoneCross Hill, Terrace, PlayGround. 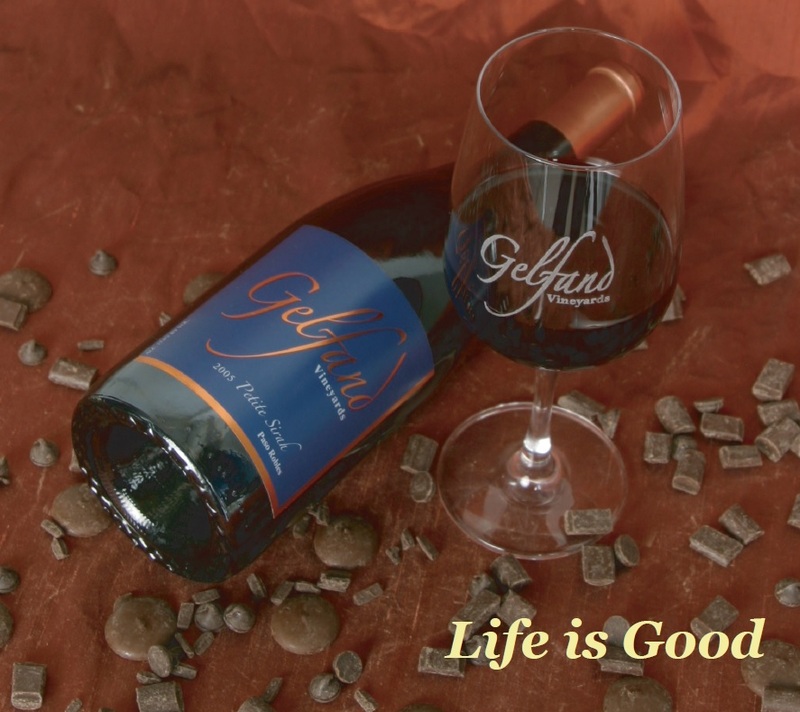 Gelfand Vineyards shares their wine country recipe and wine pairing. Gelfand Vineyards is a small, family owned and operated boutique winery in Paso Robles, California, specializing in BIG REDS. Although we have been around since 2001, we are virtually unknown outside of the area, except to our 900 wine club members who have found us during special open dates. (We are only open to the public 3 weekends out of the year during festivals). We produce about 1500 cases a year, all coming from our estate grown Cabernet, Syrah, Zinfandel and Petite Sirah grapes. 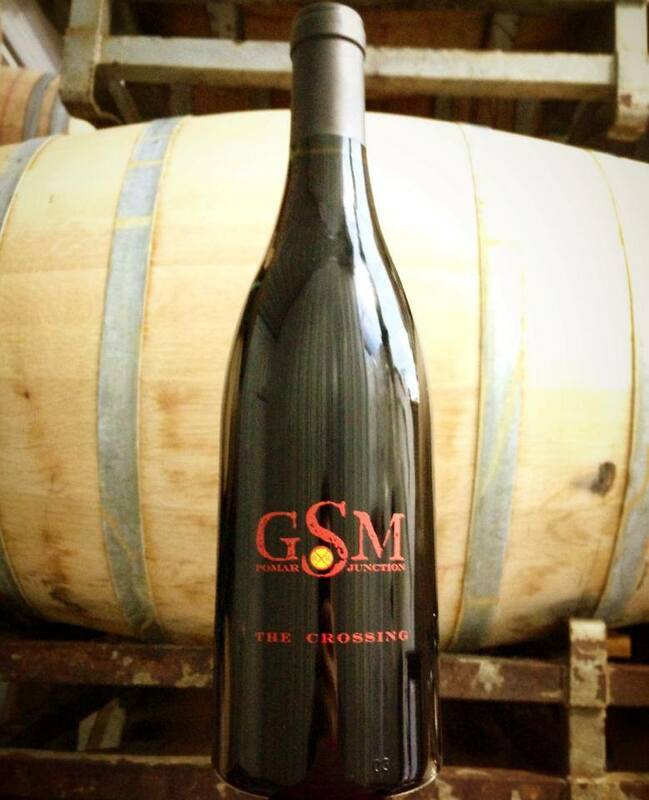 We don’t have a distributor, so you wont find us at your local wine shop, or in any fine dining establishment. But if you have the chance, please visit us during the Vintage Paso Zinfandel Weekend in March, Wine Festival in May or Harvest Wine Weekend in October, or just call for an appointment. We’d love to see you! 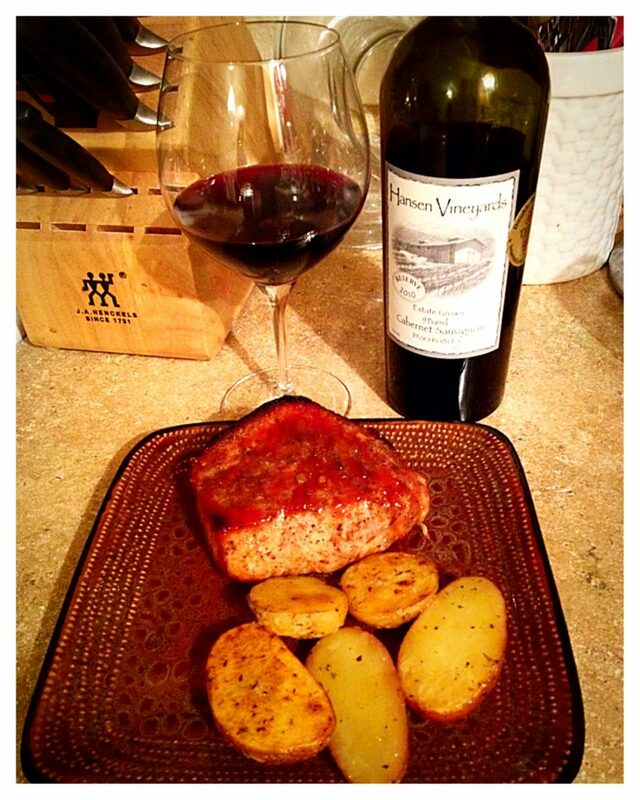 For this months recipe, pairing our rich and full bodied Petite Sirah with a pork tenderloin was a no brainer. The two just seem to belong together. The flavoring of the pork along with the bouquet of the wine compliment one another beautifully. Accompanied with a small salad, and the balance of the bottle of Petite left over from the recipe ( unless consumed while making the dish) it makes a perfect weeknight dish for just two or a great meal to serve to family and friends with your best china. 1. Heat a large nonstick skillet over med-high heat. Add oil to pan. Swirl to coat. Sprinkle pork with ½ teaspoon of both the salt and pepper. Add pork to pan and cook for 8 minutes, turning on all sides till browned. Transfer to a lightly oiled baking sheet. 2. Bake 30 minutes or until a meat thermometer inserted into the thickest part of the meat registers 160 degrees. Transfer meat to a cutting board: let rest. 3. Add blackberries, shallots and thyme to skillet and sauté 2 minutes or until slightly softened. Add wine, and cook one minute or until syrupy. Add chicken stock and any juices from the pork. 5. Cut pork into ¼ – ½ inch slices and serve with the sauce and an additional glass – or two – of Gelfand’s Petite Sirah. Carriage Vineyards B&B, one of the many wonderful lodging options located in the Back Roads area of Paso Robles wine country, is delighted to announce the completion of renovations. 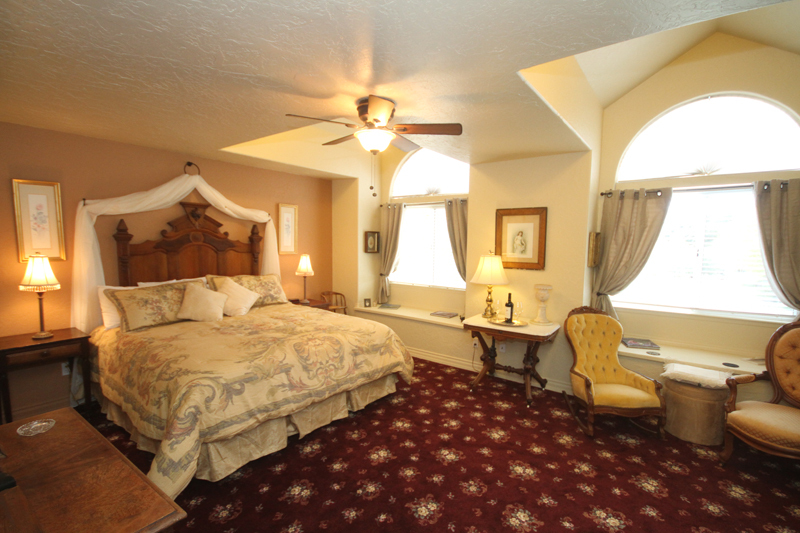 In the last year, Carriage Vineyards B&B has completed renovations on all four suites as well as many improvements to the common areas. Owner, Larry, Smyth, marvels at how fast 13 years have gone by since opening the B&B, in which time they have hosted 6000 guests! Their Grape Ed 101 vineyard tours and the Carriage rides are very popular and offer a unique wine country experience. Guests are pleasantly surprised when they come upon the Carriage museum while strolling the vineyards. For details on a wine country getaway at Carriage Vineyards B&B, visit their website and request the Winter Special – 3 nights for the price of two through March 15, 2015. Sculpterra Vineyards and Carriage Vineyards B&B create the perfect spring or summer wine country menu. Just in time for Valentine’s Day…or any day really – delicious comfort food with a twist! 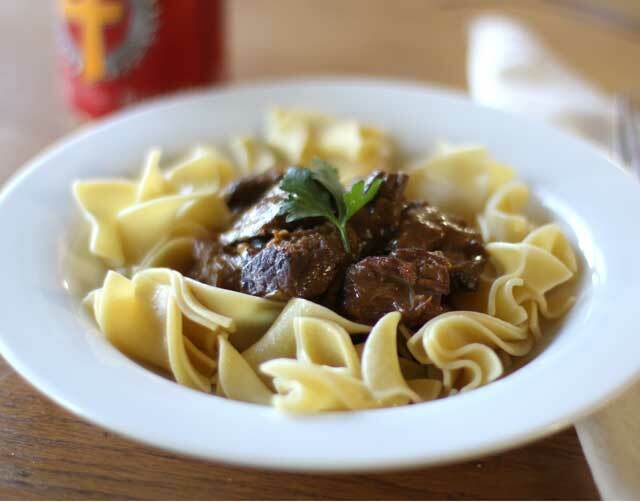 Nothing says lovin’ like a slow cooked meal of comfort food paired with a wonderful bottle of wine. 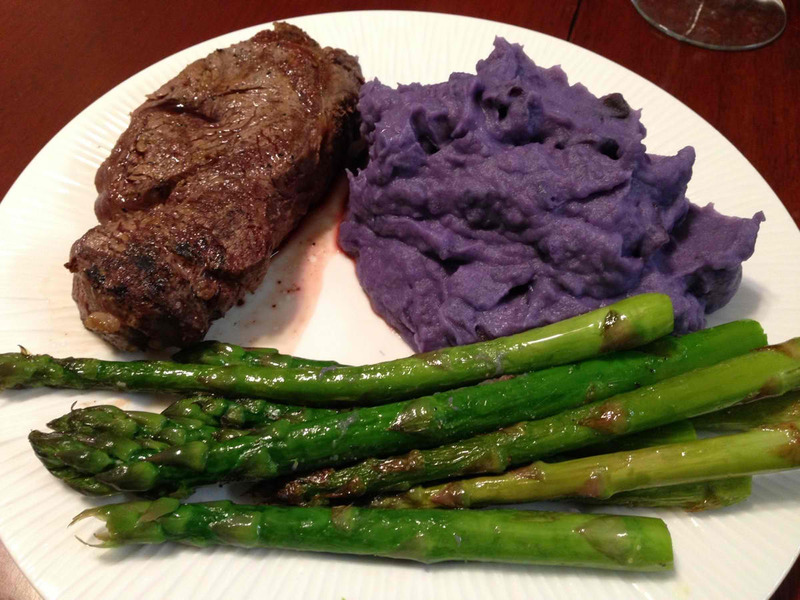 This recipe for a beef roast with purple mashed potatoes, asparagus, and herbed roux gravy is sure to impress your sweetheart. Dazzle your dinner companion(s) with your culinary creativity (not everyday you see purple mashed potatoes) and your superb wine knowledge and pairing skills by serving the meal with a bottle of Pomar Junction’s “The Crossing” GSM blend. 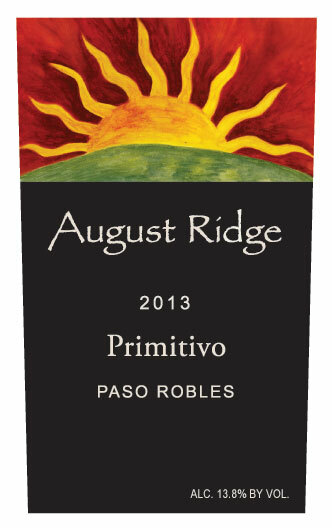 Our inaugural classic Rhone blend displays a floral nose with hints of blackberries, caramel, and herbs de Provence. A savory mouth feel is supported by flavors of red currants and charred cedar, with a distinctive lingering finish of supple tannins. The Brohaugh Ranch, where a portion of the grapes were sourced, has exceptional Southwest facing blocks that bring out the best of these varieties. Drink now or hold on for a few years to let it develop and age. Slow cook a lightly salted beef roast with fresh sprigs of rosemary on top . Keep the drippings for the gravy. The gravy should be made with an herbal roux of rosemary, sage, and a small amount of lavender. Place the herbs in 1 Tbsp of melted butter and cook over low heat for about 10 minutes to infuse flavor and then strain. Add 1 Tbsp of all purpose flour to butter (should be equal amounts of butter and flour) and cook at low heat until the flour browns (as for a brown roux). Add the roast drippings and additional beef stock (to make one cup) and whisk until the desired consistency of gravy is achieved. The purple mashed potatoes should be skinned only of coarse spots, boiled for 20 minutes or until soft, and mashed with heavy cream or butter. Blanch the asparagus and then saute’ whole in butter until lightly charred. Salt to taste. Serve the roast in chunk portions, not slices, pushed apart slightly with a little gravy poured over. Serve the potatoes with a lavish amount of the herbed gravy, and the asparagus as prepared with a small amount of drizzled olive oil. Garnish the dish with rosemary. Hansen Vineyards, producers of fine Cabernet Sauvignon from Paso Robles, shares a recipe and wine pairing. If you have visited Hansen Vineyards, then you have become familiar with Bruce Hansen and his award winning wines. He is most known for his sarcastic personality and some of the most delicious Cabernet Sauvignon in the state. You would never know that Bruce is a patient man until you start talking to him about how he makes his wine. By using only top quality French barrels, he is able to just let his wine age to perfection, sometimes up to four years, without touching it until he is ready to bottle. This creates a wonderfully complex, yet simple body to the wine with the smoothest finish. One of my favorite questions I love to hear asked in the tasting room is, “What food do you pair with your wines?”. Since Cabernet Sauvignon is typically such a big wine, it is more often paired with hearty red meat based dishes including steak, roasts and ribs. Although, depending on the flavors and textures of the wine, you may often see it paired with pork, chicken, or lamb dishes. Being that I love to cook and try new recipes, I wanted to pair the Hansen Vineyards 2010 Reserve Cabernet Sauvignon with one of my family’s favorite dishes around the holidays because it is hearty and tasty – something a bit different from a traditional steak. The 2010 Reserve is a beautifully complex and simple wine, that has quite a lot of flavors that mesh together and become smooth as velvet. There are dark cherry and spicy earthy notes to it with hardly any harsh acidity, which is why I chose to pair it with Bourbon Glazed Double-cut Pork Chops with roasted herb potatoes. There are so many flavors in this dish that go perfectly with the wine and it is great any time of year. Pepper, sweet, savory… I hope you all enjoy it as much as we do! Prepare the pork: Mix 2 tablespoons salt, the black pepper, brown sugar and paprika in a bowl, then rub all over the chops. Wrap in plastic wrap and refrigerate 2 to 4 hours, up to 2 days. Meanwhile, make the sauce: Melt the butter in a saucepan over medium heat, then add the garlic. Stir in the vinegar and brown sugar until dissolved. Add the ketchup, apple juice, syrup, bourbon, Worcestershire sauce, cayenne, 1 tablespoon salt and 1 1/2 teaspoons black pepper and bring to a boil. Reduce to a simmer and cook until thickened, about 30 minutes. Puree with an immersion blender or in a regular blender. (The recipe makes a lot of sauce, so you can store it in the fridge for later use). Preheat a grill to medium. Brush the grates with olive oil, then place the chops directly over the flame and grill until marked and cooked halfway through, about 15 minutes. Turn the chops and place on a cooler area of the grill (such as the edges); cover and cook until a thermometer inserted into the thickest part registers 140 degrees F to 145 degrees F, 15 to 20 minutes. Uncover and brush the chops on all sides with the prepared sauce, then cover and cook until glazed, about 5 more minutes. Transfer to a cutting board and brush with more sauce. Tent with foil and let rest 10 minutes. Serve with more sauce. Place the cut potatoes into a ziploc bag. Combine the herbs and add them to the potaoes, then shake the potatoes until they are covered in the herbs. Place the potatoes into the skillet with the butter, add the stick of rosemary, cover, and cook until the potatoes are slightly soft, about 20 minutes.